I'm in the Latin Quarter of Paris right now, sitting in a two thousand-year-old Roman coliseum and watching kids play football in the same spot where gladiators fought lions in the first century A.D. I wonder if the kids know that. This is right across the street from our apartment, and was an unexpected find when we arrived. We've spent the past few days wandering around Paris and visiting both the touristy and the "true Parisian" spots. I've come away with an interesting impression: the history of France is characterized by the power of ministry, monarchy, and military. I'm sure France is not alone in this. The great Notre Dame Cathedral in Paris shows the power of the ministry. I'm absolutely awestruck by the incredible workmanship of a building that's withstood eight hundred fifty years of wars and weather. The architecture outside and the artwork inside are humbling. 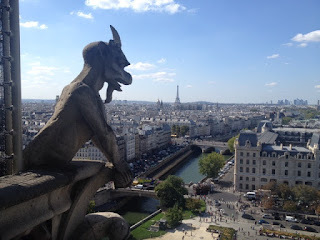 We climbed up to the bell tower and petted the very gargoyles from the Disney movie. I'm sure of it. But like the cathedral in Rouen, again I'm left wondering if the purpose of the building was to encourage piety and faith and bring people closer to God, or was it to inspire fear and awe of the clergy. I'm not being critical of the Catholic Church, because I think religion has always been used as a means to promulgate power around the world in many faiths and cultures. I just question the point of such a grand structure, while at the same time I greatly admire it. But at least many in the ministry tried to help those in their care who needed it, whereas those in the monarchy just seemed to abuse the commoner. We visited the Palace of Versailles and saw the power of the crown. That's another building that shows the great ingenuity and artisanship of the French people. It's beautiful and HUGE. 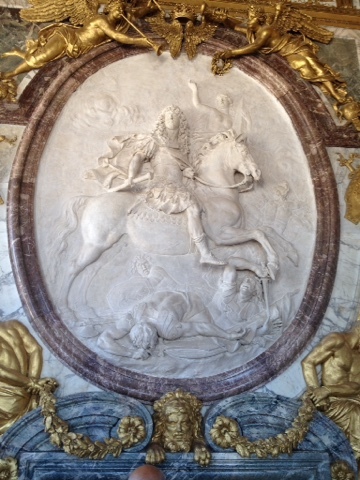 The whole thing was designed to enforce the idea of deifying King Louis XIV. After seeing the excess of this monstrosity, I can understand why it all led to a revolution. Now in France the commoner probably has TOO much power, with their daily strikes and demonstrations. Personally, though, I'm glad the everyday person has that ability now, as obnoxious as it sometimes can be. Like most of the world, France has a bloody military history of war after war after war. In the Battle Room at the palace, there are large paintings depicting many of the battles France has fought, the first one in about 600 A.D. 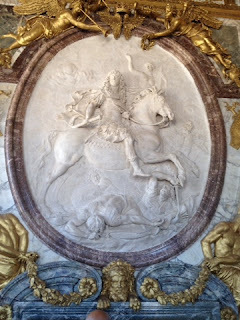 Most all the paintings show a victorious general on a horse, with dead or dying enemies at his feet. It's not a pretty sight. In the U.S., France has an undeserved reputation as a pacifist nation. After seeing all these terrible battles, I think I much prefer avoiding war, not jumping into one. Too bad more nations don't feel the same way. Maybe we should bring the leaders of warring nations to this coliseum and have them battle it out themselves. What Happens in France . . .